It is likely that today the Venetian blind is one of the most popular window blind products for the Integral Blinds UK market. Since the introduction of this versatile product in the late 1960s to early 1970s, the acceptance of it by the public has continued to grow. The adoption of continental office space design in the 1970s provided the perfect development of the Venetian blind market. Traditional products such as curtains limited visibility, light and accessibility to windows and doors. Suddenly Venetian blinds accentuated the lines of windows, gave full versatility over natural lighting and provided privacy and security through controlled visibility. Those were the days. Now wind forward to the early 2000s when the integral blind was introduced and accepted. 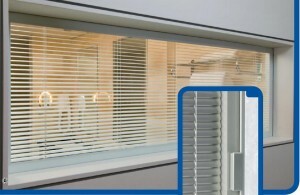 This was seen as a transformative development over the traditional Venetian blind. The integral (or interstitial or integrated) blind could be supplied with pleated or Venetian blinds which were encapsulated within the double glazed unit. This exceptional product gave all the advantages of the Venetian blind but with the added benefits of being protected from dust, dirt and damage whilst having perpetual youth in that they never faded. Being as easy to install as fitting a double glazed unit and having such easy and simple operation they really drove the Integral Blinds UK industry forward. Now more advanced with thoroughly tested and mature systems, the integrated blinds in double glazing is truly established in the UK domestic market. Sunshade Blind Systems supply an aluminium Venetian blind system in a range of fourteen colours, as a standard product in glazing sealed units. Operated by unobtrusive magnets sliding down the sides of the window the system is easy to operate, has longevity and is totally safe for all to use. All the mechanics are contained in the window glass so nothing can go wrong and the only interface with people are the sliding magnets, so with today’s pressing issue being child safety it can be assured that this integral blind is totally safe for all. Today, with the massive impact of bi-fold doors, conservatories and orangeries on the domestic market what could be better than a blind that suits all products perfectly. The Sunshade blind system is an ideal accompaniment for all types of door and all styles of window and is thus the superlative accessory for the modern lifestyle. Sunshade Blinds is at the forefront of production of integral blinds UK. If you have had your double glazing in for some years it is now time to replace them with the new heat efficient coated double glazed sealed blinds. You will be aware that the Government has been promoting energy efficiency and all new double glazed units now have to meet minimum standards of thermal efficiency. The effect of this is that new double glazed units will help keep heat in by reducing conduction, increasing insulation and trapping the heat from sunlight. Sunshade can supply integral sealed blinds in all the various new specifications required. All new double glazed units have to meet a minimum of a C Rating and many are of the higher A Rating (these ratings indicate the thermal performance of the units with A being better than C). The ratings are achieved by a combination of hard or soft coatings applied to the inner surface of the glass, inclusion of Argon gas and the use of an aluminium or ‘warm edge’ spacer bar. You will be pleased to know that Sunshade Blind Systems can supply the entire range of integral blinds with any of the above specifications. Should you need to adhere to the Secure By Design standards (toughened glass and Laminated glass) – NO PROBLEMS! Sunshade can also make blinds including these types of glass. 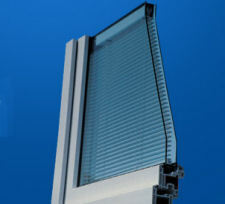 There is the Active™ range of coatings, patterned glass, solar control tinted glass, 6mm thick glass and many other variations and specifications, they can all be built into Sunshade’s blinds. So, Sunshade can help you achieve savings in your energy costs! If you want to find out more about sealed blinds call us on 0800 310 12 22 or use our contact form. People say that the eyes are the window of the soul, but we would argue that your windows are the soul of your house or a building. Many people like venetian blinds but do get frustrated at the need to clean them and that they flap about in the breeze. Some worry about the safety of their children as there have been cases of young children harming themselves on the venetian blind cords. Well there is a solution to all these issues and one that gives many other benefits over conventional venetian blinds. These blinds are commonly known and “integral blinds”, “integrated blinds in glass”, “interstitial blinds” or “glass with blinds inside” to name but a few. They do not need cleaning and are maintenance free. They do not flap about in the wind. There are no cords hanging round to endanger children. They don’t get abused by children playing with the blind slats. They have the benefits of insulation that a normal double glazed unit would have, but also have the benefits of privacy that the venetian blind brings. They help with sound insulation. They can be used for external and internal windows and doors. They are more stylish than conventional venetian blinds because they are enclosed. 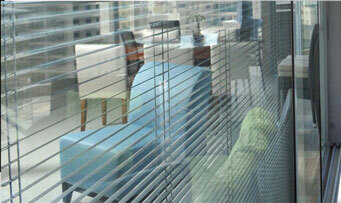 They are more durable than conventional blinds because they are enclosed and protected from normal wear and tear. You can manage the amount of light entering into your room with a simple control. Allow great temperature control because you can shade a room from direct sunlight. They have a patented magnetic drive system so they are sealed within double glazed units without compromising the integrity of the hermetic seal of the window. The seal ensures that air and moisture cannot get in once it is sealed. For the installer, Integrated Blinds give you the chance to add value to a conservatory or window project. If you want to find out more about our glass with blinds inside call us on 0800 310 12 22 or use our contact form. 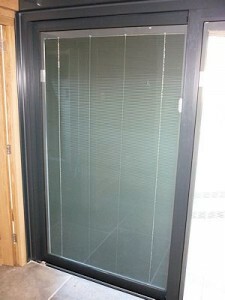 How to manage integral blinds? The importance of managing sunlight and the resultant glare in domestic and commercial situations whilst still being able to retain a view of the outside has created a marked increase in the demand for integral Venetian blinds. With widths between 300mm and 1500mm and heights to accommodate tall doors the integral Venetian blinds supplied by Sunshade Blind Systems help fulfil this demand. Every integral blind supplied by Sunshade is bespoke to fit exactly the sizes required. Being only 0.7mm thick the slats can tilt and turn, and be raised, thus can allow as much or as little light to enter as necessary. This can give an almost infinite intensity of light whilst shielding from direct sunlight and glare. It can also provide optimum external energy control. Integrated Venetian blinds can be set with the optimal slant angle, meaning units provide the best possible room lighting even when they are lowered. 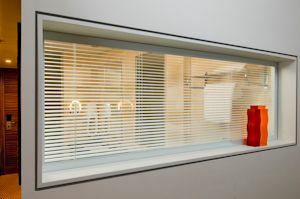 The blinds provide the ability to offer heat protection, can be adjusted to suit external light conditions and having slats on 0.7mm thick they are barely visible when horizontal. Having such a fine level of adjustment means that the slats can be set at the optimal angle and thus can save costs and energy in artificial lighting and climate control. When combined with almost any coating on the encompassing sealed unit and with an Argon filling, Sunshade integral blinds can provide one of the most energy efficient window applications on the market. When customers need privacy but don’t want heavily dressed windows, the subtle quality of Sunshade integral blinds offers a light and contemporary alternative. The blinds are supplied fully encased in an A Rated sealed unit (Argon filled with a centre pane U Value of 1.2) and can be used in windows, doors and room partitions in residential, offices, shop fronts, hospitals and other commercial situations. All units are supplied to the normal glazing sizes as specified by the frame manufacturer and are easily installed by any glazier. As the demand for high-specification residential accommodation increases, so does the demand for advanced light control solutions. Sunshade’s manual and motorised blinds are a smart choice to grow installers’ businesses by providing the ultimate in integrated control for both natural and artificial light. There is a choice of manual and both wired and wireless solutions that can meet any installation challenge or budget, enabling flexible daylight control. Sunshade Systems’s priority is to grow its customers’’ businesses where-ever possible and to work hard to develop solutions that respond to installations issues, as well as key trends in the market. Sunshade has a product solution to help them, no matter what the problem or application. 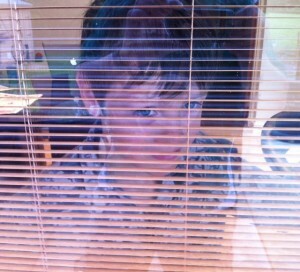 Integral Blinds as a means of privacy. Sunshade Blind Systems offer a stylish and versatile method of achieving privacy and observation on a small, medium or large scale. These observation panels are ideal for almost any commercial situation including offices, meeting rooms, interview rooms, production facilities, hospitals etc. Binds in window glass are well suited for doors, sliding panels, store fronts, floor-to-ceiling partitions, screens and domestic glazing. The glass panels are double glazed units and are delivered ready to install. Every unit comprises of Toughened glass throughout (or combined with Laminated glass), is Argon filled and has a minimum centre-pane U Value of 1.2. Provided there is a 20mm cavity in the sealed unit any type of coating can be supplied including tinted glass, low emissivity, solar controlled and self-cleaning (external face). Panels come with a user-friendly manual magnetic control or can be motorised with either mains or battery power which can come with solar power and remote control if required. 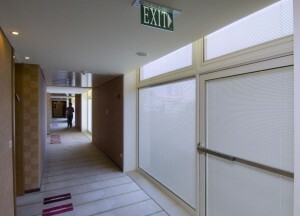 Sunshade Blinds is the ideal solution for all types of privacy and observation panels in a multitude of domestic, commercial and public sector applications. The panels give a openness to areas whilst retaining the option of having privacy when required. To find out more take a look at our range of Integral Blinds or call 0800 310 12 22. Click on the image to see the colours that Sunshade Integral Blinds can have. In order to cater for the widest range of tastes and aesthetics Sunshade Blind Systems can supply integral Venetian blinds in a palette of fourteen integral blind colours – this is nearly double the range available from other integral blind suppliers. The colour range is designed to complement users’ lives by blending in with the contemporary modern styles and colour schemes available today in sealed window blinds. Intending to cater for aluminium, wooden and PVCu systems in domestic and commercial applications you can be sure that almost any window and door system colour can be matched or complemented by the Sunshade Integral Blind Colours range. 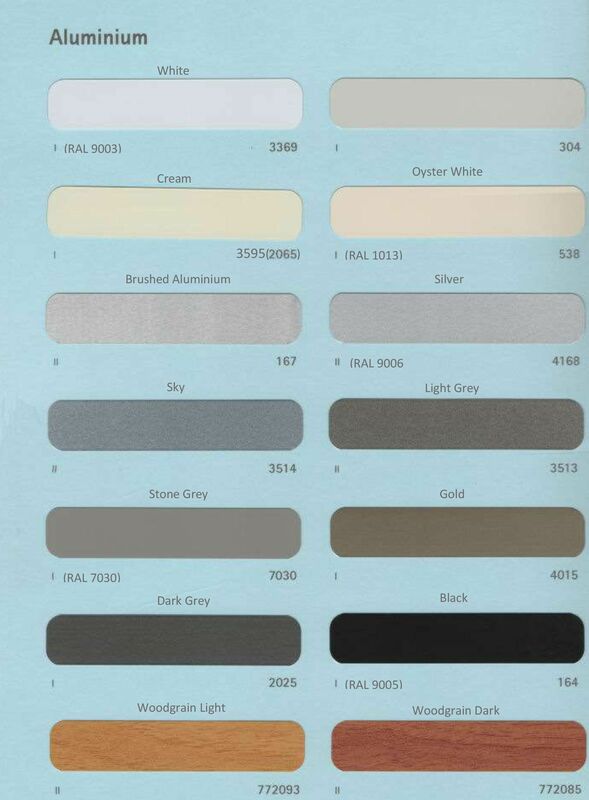 Extending from White through the pastel colours of Cream and Oyster White the colour range can complement all aluminium systems with Sky and the Greys (Light, Stone and Dark) and Black. Sunshade is unique as it is the only UK supplier of Black integral Venetian blinds. No other blind system can currently supply a black integral blind. To add a touch of class and the exotic the blind can even be specified in Gold! To complement the increasing popularity of wooden windows and doors Sunshade’s blinds can now be specified in a light or dark Woodgrain effect print. These cater for Oak or Mahogany products. 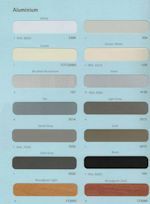 If you want to find out more about our Integral Blind Colours call us on 0800 310 12 22 or use our contact form. With Sunshade integral Venetian blinds there are no old fashioned cords or wands for controls. Our blinds have hand controlled powerful permanent magnets running either side of the sealed unit. The magnets are discrete and unobtrusive, are smooth to operate and never wear out. They give a contemporary and stylish look to integral Venetian blinds that tilt and turn, as well as raise and lower.